Heat Progresso™ soup according to instructions on can. Cover with lid to keep warm until ready to serve. In a medium size bowl, combine the beans, cumin, and garlic salt and mix well. Spread about 3 tablespoons of the refried black beans on each tortilla. Add guacamole and corn to taste. Add cheese and a few slices of the fresh chile, if desired. Serve the tacos with warm soup. To make it a vegetarian meal, use a vegetarian Progresso™ soup. Is there anything better than a full meal made in less than 10 minutes? Don’t think so! These types of meals are priceless to me since most nights I don’t have the time to cook complicated meals. 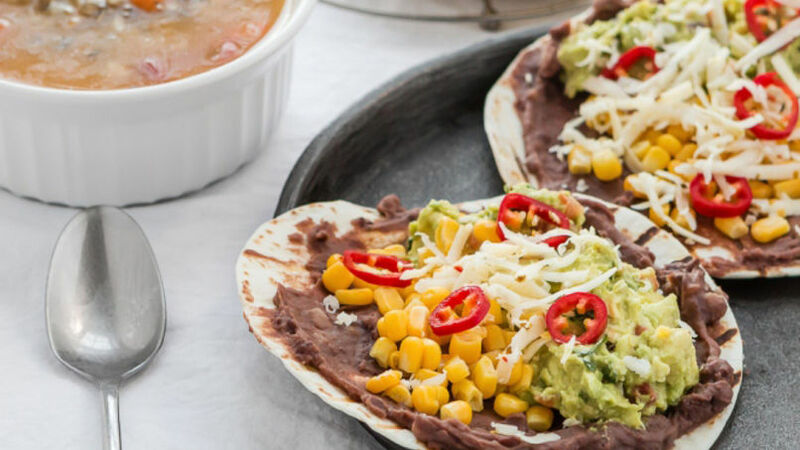 These black bean tacos are truly deliciosos. They don’t include any kind of meat, but I promise you won’t miss it because these tacos are full of sabor. To complete your menu, serve these tacos with a wild rice Progresso™ soup!